T/C White Line Paint is a 100% acrylic emulsion paint. Pavement surface must be cleaned entirely of dust, dirt, debris and all loose material. 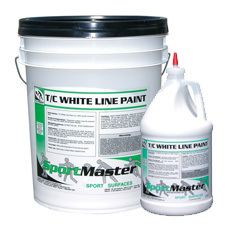 If using T/C White Line Paint on a new, uncoated surface, allow adequate curing time before application. T/C White Line Paint can be rolled, brushed, or sprayed. To assure crisp lines, it is advisable to use tape to mask lines. Remove tape as soon as line paint has dried. T/C Line Paint can be modified to match the texture of the court surface by adding an 80 to 100 mesh silica sand. View in Catalog 1 gal. Jug 12 lbs. 5 gal. Pail 60 lbs.